Impressive eyes can make the person attention seeker and effective eyebrows can add to the beauty of eyes as eyebrows outline your eyes. If you are not having sufficient hair on eyebrows then there is no need to worry about as eyebrow hair transplant can be lucrative for you. Our experienced surgeon perform eyebrow hair transplant in perfect manner to restore natural look of brows that was damaged due to plucking or some kind of scars. 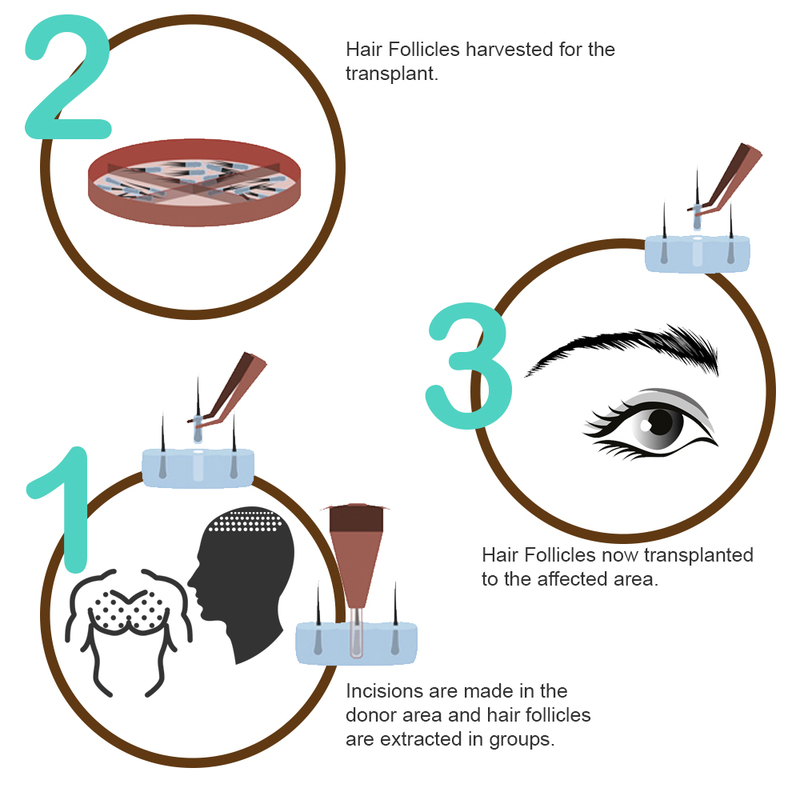 It is the highly magnificent method used to transplant the small region hair taken from stable zone of scalp. Eyebrow restoration is the procedure of 3-4 hours depending on the extent of problem and it has been done under the local anesthesia for the comfort and painless experience of patient. Before performing the FUE eyebrow transplant surgery , Dr. Mohan examine the shape and size of eyebrows carefully to restore them accordingly so before performing the surgery , outline of eyebrows has been created so that normal position and symmetry can be retained. This surgery has been done to restore hair in the correct direction and accurate angle so focus has been given to the development of elegant increase of arch to give desired natural shape of eyebrow to patient. For restoration of eyebrows FUE method has been used to offer faster recovery, smaller down time and excellent results without scars. Individual hair grafts are taken from the backside of head as this area contains the largest count of loss resistant and healthy follicles that can give permanent results. One by one grafts are transplanted in the small region on exact angle, distance and depth by keeping in mind the direction of existing eyebrow hair so that natural look of eyebrows can be restored. Generally males and females have different shape of eyebrows as the eyebrows in men are thicker and in horizontal direction whereas females have delicate and magnificent shape of eyebrows. So there is need to put extra attention while performing the eyebrow hair transplant surgery and only the experienced surgeon can perform this surgery to give natural look to males and females according to their eyebrows. After surgery patient can have mind blowing results as they can get characteristic development of hair on eyebrows and the desired shape. After surgery patient can have the complete change look with more hairs on eyebrows that mimic the shape of natural eyebrows. The best quality treatment given by us for eyebrow restoration give outstanding results to patients without side effects.